Handmade stained glass kaleidoscope by Allison Borgschulte. 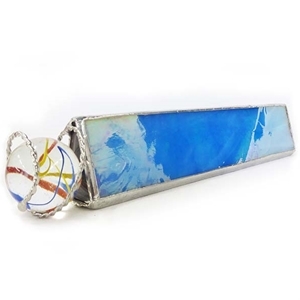 The outside casing is made with sky blue glass that is iridized to have an extra shiny finish like the surface of oil. It contains a 2 mirror system which results in a star shaped image. There are 12 reflections and 6 points on the star. Comes with a jumbo sized marble which is interchangeable with other marbles in your collection of a similar size. Interior photos shown are taken with the marble that you will receive. The marble is held in the scope with a coiled wire, which flexes to accommodate marbles ranging in diameter from about 1" to 1 5/8" or so. The kaleidoscope is 8" long(not including wire and marble). For more variations, consider purchasing assorted jumbo marbles or handmade 6 pack of marbles. While in the shopping cart, specify that you would like transparent styles for kaleidoscope. Allison Borgschulte Kaleidoscope & Hot House Glass marble - "Color Block Rectangular Scope"